Earlier today, I put together a poll with a list of segments I feature on the blog and want readers to vote on their favorites. You can locate this poll on the right side of the blog. If you are using a mobile device, please make sure you are viewing the web version to find. It literally takes just a second to vote and yes, you can vote for more than one. Why do you ask am I putting together such a poll, well, I am just curious to see which ones are most popular and maybe ones I will use more often. I don't plan on making any drastic changes such as taking any away. I feel this year has been the best year of this blog yet and I think what I have incorporated on here is finally up to par where I wanted it three years ago. So please, if you are reading this, just take a quick second out to vote. Voting ends when July does so there is plenty of time to vote. Like I stated earlier, I am hoping just to gather some info for myself and I will share the results with you guys as well along with my thoughts on them. A good amount of votes would help with this so please RT, Share, and spread the word! 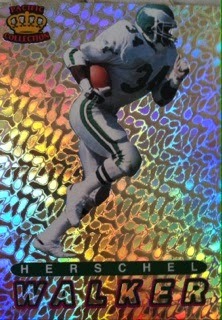 To me, this is always the first REAL football card release each year as it's one the NFL's firsts other than Bowman. 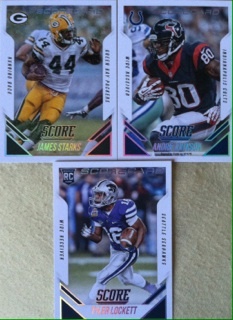 But, not being a fan of Bowman, I always go straight for Score. I know I am always guaranteed well designed inserts, tons of base for a set, lots of rookies (my big aim) and just a good time. This years Score proved to be no different. I actually had so much fun, I ended up getting two hobby boxes and extra packs on the side. This one is for review purposes but stay tuned for the second one that I pulled a 1/1 in and possibly the breakdown of the extra packs too. 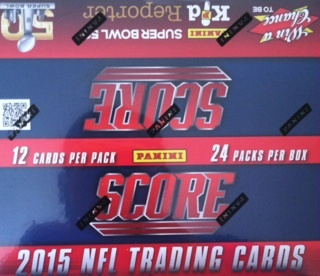 In every box of 2015 Score football, there are 24 packs with 12 cards per pack. So you know you will be getting your money worth. 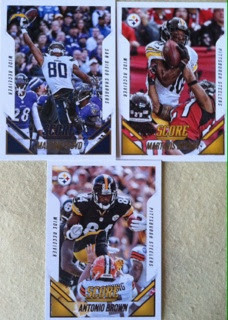 Each pack comes with a couple inserts and 2-3 rookies. Boxes will run you roughly $45 so spending a little on possible big return. 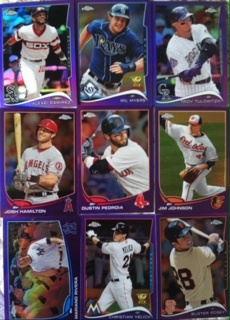 This years base cards like the last few years are done very well. The border on the cards, usually a problem for me, is done perfectly here acting more as a frame to the action shots than a bother. Some of the photos bring you back to certain moments on the field that you remember from last season. It also captures the raw emotion of the game. More great photos here. I think we all remember watching this Antonio Brown foot kick to the face of the Browns punter. The base also has most of the players with their new teams. 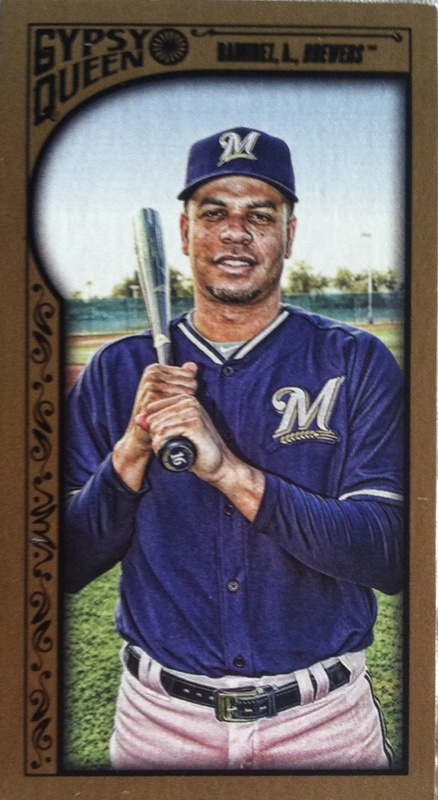 The rookie cards in the base set this year are massively improved. Gone are the head shots, in with the action shots. 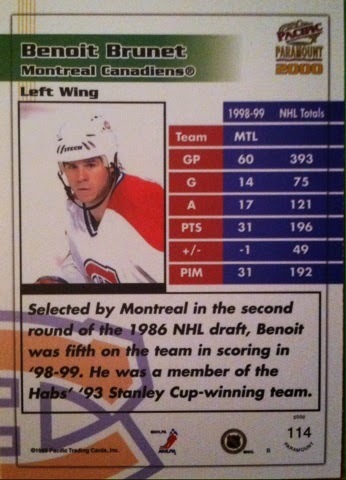 This change happened because of Panini's deal with a CLC license. This type of addition to the set massively improves this product and adds a bit of 90's flair to it as well. In all, there are 440 cards in the base set including 110 of these rookies. Also, just in years past, there are photo variations. Most of them are easy to find and I found out that in your pack if you find a base card facing backwards in the middle of the pack, that's you variation. These are falling roughly one-per-box. The thing with Score this year is that it's loaded with parallels. Even the photo variations have them! There are Blue Camo, Desert Camo, Green Camo, Night Camo. Here is a Peyton Manning one I found in my box. These as well fall one-per-box. There are other parallels to find as well. In my two hobby boxes, I came up empty on them except my three Scorecards. 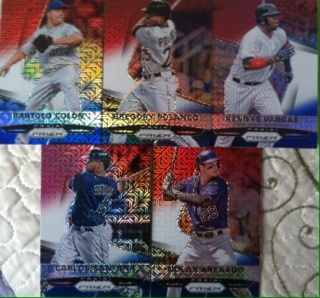 These are unnumbered parallels as opposed to the others. And speaking of parallels. HOLY MOLY there are ton! There are parallels to EVERY SINGLE INSERT set. Each one of the following comes in Red, Green, Gold,and Black. It seems the black parallel is the toughest as you only find a couple of those per box. So for us team collectors, you could gather quite a few rainbows together. There are some classic designs here as well along with some new ones. I am quite impressed myself. You get quite a mixture of regular and parallel inserts in every box. Black parallel of Jarvis Landry! Loved this design. Totally throwback! 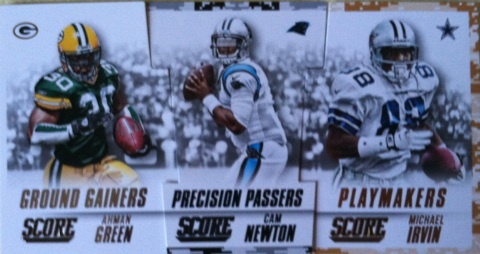 And the most fun insert of all....fun puzzle cards of top fantasy players you can make any combination of. Who would you put together as a team? You have Ground Gainers (RB), Precision Passers (QB) and Playmakers (WR). These have parallels as well as you can see. Blue Camo, Desert Camo, Green Camo, and Night Camo like the one of Cam Newton I found. In every box you are guaranteed at least one hit. I have seen some boxes online with an auto and a mem. 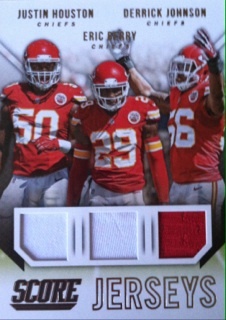 My box came with a memorabilia card, game used too, of a trio of Chief defenders. Pretty cool for a low end product and second hardest other than a quad jersey. I like the design and layout as well. There are some top notch players to find for autographs such as Tom Brady and Peyton Manning along with all of the top rookies. What can I say? As you can tell by my positive review, I am a huge fan of Score. This is not only fun for adults but a product that would be fun for kids as well. 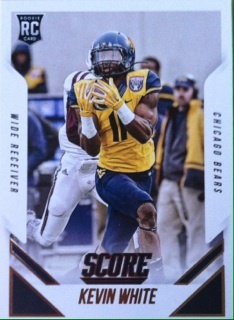 With a low end cost, big checklist throughout there is plenty to collect and be excited about in the 2015 version of Score football. YOU'RE BEAUTIFUL....YOU'RE BEAUTIFUL....YOU'RE BEAUTIFUL IT'S TRUE.....I SAW YOUR BASE...WHEN I UNWRAPPED IT FROM IT'S PACK FACE....AND I DON'T KNOW WHAT TO DO...CAUSE I WOULD RATHER COLLECT YOU....Sorry James Blunt. My version is better. 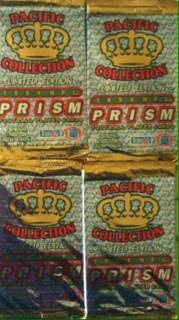 1994 Pacific Prism. If you haven't seen what these bad boys look like, well, you are missing out. So let's get a small viewing shall we in my newest and final break from that trade I did with @batcavelv. Time for another Breakin Wax! 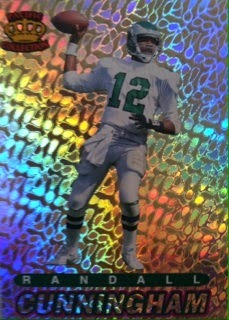 In every pack of 1994 Prism football is one, yes, ONE card. And each pack you can roughly find easily for under $2. 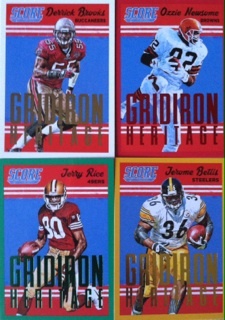 There are also a couple of chase insert sets to look for as well such as the Gold parallels and Team Helmets. Another thing to look for in the 1994 version is rookies of Mario Bates, Trent Dilfer and especially Marshall Faulk. But enough with the past history, now onto some busting!! Eagles QB, well, a lot of teams QB but Eagles here, Randall Cunningham. Despite being an Eagle, I loved to watch this dude play. Another Eagles find, ugh, RB Hershel Walker. I only liked him a few seasons later when he signed with my G-Men! And finally WR from the Buc's and their ugly uni's, Lawrence Dawsey that I don't honestly know much about. Overall, fun break and shiny cards. You know how that goes with me. 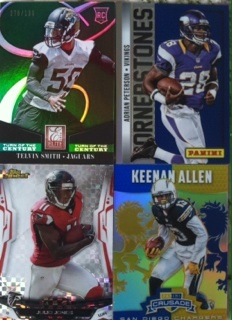 As for hits and big rookie pulls, I didn't land em but I did like finding the Cunningham. This is a product I wouldn't mind chasing down a set of. I think building it through busting a box would be the most fun as you would hope that the next pack would be that key card you are missing. Stay tuned, I might try to find more! Picture a collecting world without autographs and jersey cards..... would you still collect? Why or why not? Would the hobby survive? Would more people collect? Less? Impatient. That is what I am when it comes to redemption cards. First of all, I don't like pulling them. Second, I don't want to wait to receive them. I would much rather get it replaced on the spot! Even if it means losing out on a good player. Well, last week, my impatience got the best of me. 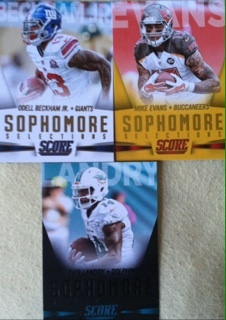 Back in January, I pulled a redemption for a 2014 Panini Contenders Jarvis Landry Rookie Ink auto. I was very excited about the pull knowing of Landry's talent so I told myself, yup, this is one I will hold out for. How could I not want to wait? A Top rookie talents autograph is definitely worth the wait. But, once again, my itching to just have a card instead of patiently waiting got the best of me and I had it replaced with a player from my team instead. It's a beautiful card. 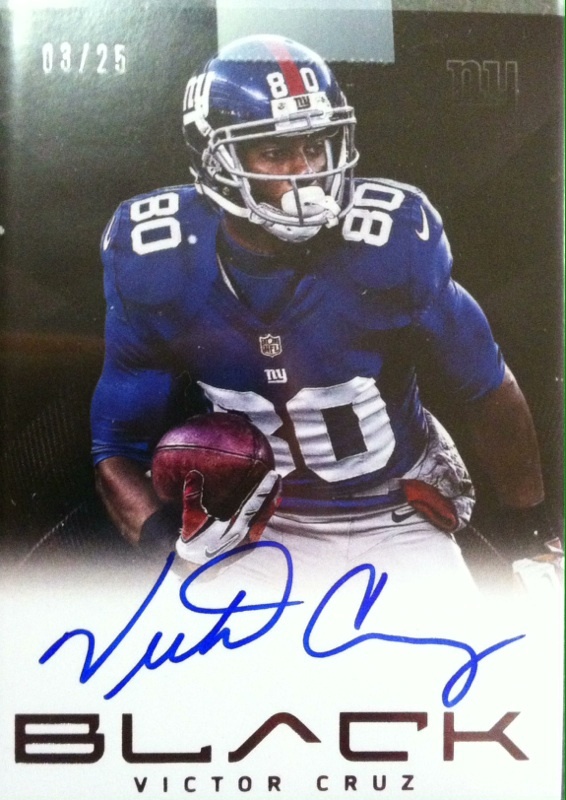 Great player and not an easy autograph to acquire and it's on-card. It's also from my favorite team and only my second Cruz autograph. However, the voice in the back of my head has begun to argue with me over my decision this time. I am usually fine with my replacements, but this time I just wonder about the future prospects of Landry as he has put on another strong showing during OTA's while Cruz, despite a well established player, is coming off from Achilles surgery. I am a bit mixed on feelings. So I need your help to ease that voice in my head. Did I make the right choice? Would you have waited? What's the best/worst scenario you had when getting a redemption replaced or do you wait for them? Looking for your honest thoughts! Last week I participated in my very first and the inaugural, Graded Greats Wax Museum TV break. What is that you may ask, well, I will break it down for you in simple terms. 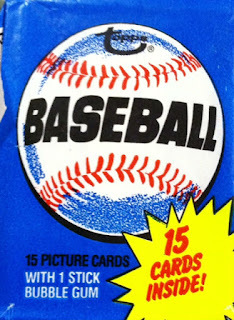 On top each pack spot you get in for, you also get a CHASER BOX with a Vintage HOF Card or Cards. And as another extra bonus, Graded Greats will create a checklist before each night of breaks with replacement cards for random commons that you may pull out of your pack. 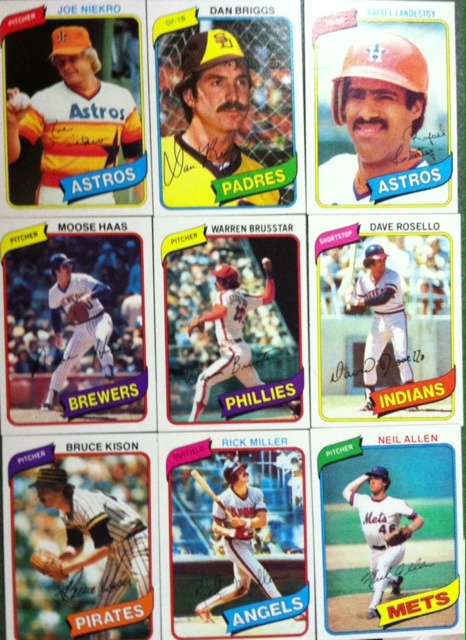 For an example, as taken from their site, in 1980 Topps they may replace the Expos team card with a HOF relic. That's a pretty cool bonus and something you will see happened to me as you continue reading..
Now onto a real example of what their breaks are about. For my random pack, I was randomed 1980 Topps baseball. My pack break was extremely weak. This Gossage was pretty much the highlight of the pack as I found no Rickey Henderson (I am pretty sure someone else had pulled one in the break) or other stars. I do like the base card design however. 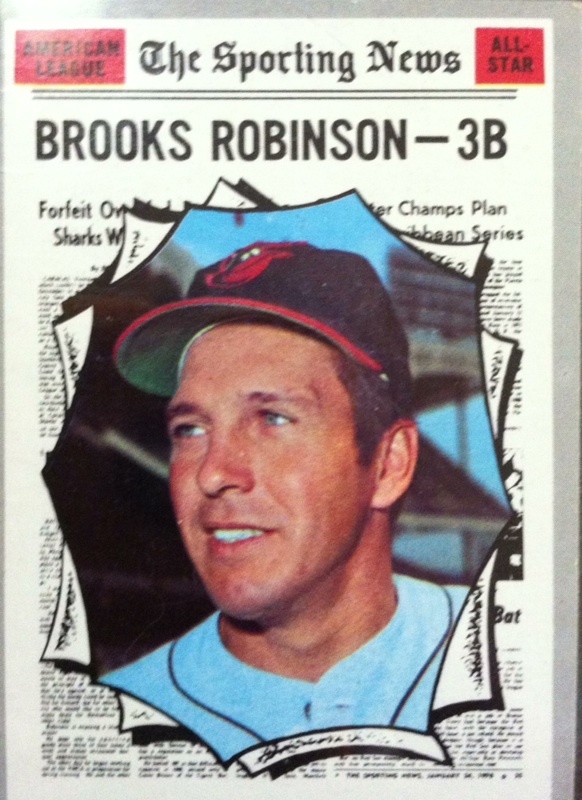 For my Vintage HOF raw card I got this 1970 Topps Brooks Robinson. 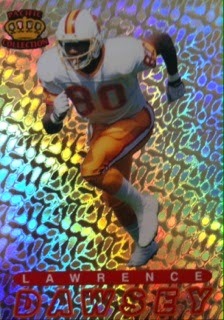 Absolutely love this card and the player. Overall it was a fun experience, I just wished I had been a bit more lucky with the pack. If you are a fan of vintage breaks/cards and don't mind taking a little risk for what could be a huge payoff, I recommend you give this a try. The bonuses are nice as well and one of them is even a Stan the man Musial auto! Find out more information and to get a spot right HERE..
What can I say.....I love Pacific! Pacific always put out some tremendous products in the 90's and early 2000's. I can only imagine what they could put out now-a-days. It also makes me very sad at the same time. 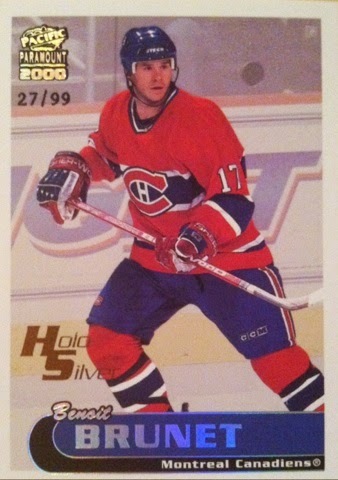 This particular card I acquired in a trade with my father who was looking to move some 90's hockey inserts, more to come, for some newer day rookies. The trading world can be very scary place when attempting to start a trade for the first time worrying if you will get a card in return and trusting who you trade with. Whether you are new or a veteran trader, I thought I would share my insight on how to do a successful trade. Because at one point, I was in the "too scared to attempt one" stage. I find these 5 tips I have discovered for myself very useful and a great way to not only make yourself happy with a trade, but your trading partner as well. Do Your Homework: Don't just trade with anyone who offers you a card you want. Do your research on the person. I go through many steps before I will trade with anyone especially if I don't know them. I will check out their profile and what they post about, who they associate themselves with and what they collect (this works on Twitter and on some forums), I will message my trusted traders and friends, if I get good feedback I will make the trade. Bad feedback, I will turn them down. And no feedback, I won't trade either. So many bad things go down in the hobby and you don't wanna lose a card because someone is trying to scam you. I know there is probably the good trusted people who may not info on them yet, but I am not willing to take the chance. Others may and you might. Packaging: Place all of the autographed/jersey/patch cards and so on in Top Loaders or if they are really valuable, One-Touch. Make sure to place all cards in penny sleeves and into team bags for efficient shipping. Most important thing is to OVER protect your trading material. You don't want your cards end up on the other end damaged. That could make for a very messy situation and cause yourself to lose a good trading reputation. Even one mess up. Bonuses: Always ship bonus cards. I always throw in a couple of unopened packs and depending on team likes, a few inserts, bonus auto or memorabilia card or a stack of base. If you find a good trading partner, you want to reward them and have them come back again. Shipping: When shipping your package out, make sure to ship with TRACKING! Don't ever ship a trade package out without it. USPS has been awful as of late and you want as much info on your package as you can get. You may also want to consider Insurance as well if the value of your package exceeds a certain amount. These are tips that I have learned along the way. You may or may not agree with them, but no matter how you feel, they have worked for me. I have never had any problems with my trades. What are some tips that I didn't list above that you have when it comes to trading? 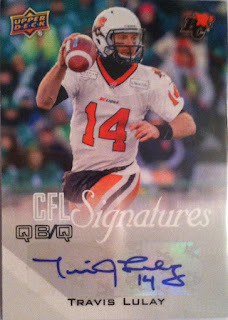 Upper Deck NPN Mail Day...CFL Auto Style!! 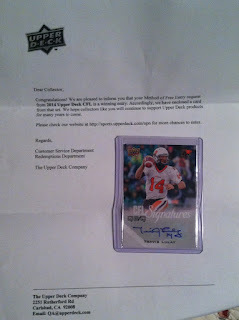 Upper Deck+Free online entry+Free Upper Deck card in the mail=One happy collector. It had been a LONG time since I last had gotten one of these. I normally enter the Upper Deck ones only due to the fact that they are online and so easy. I have also had decent success as well. Onto this score, which by the way is going in the PC,...I got a 2014 Upper Deck CFL autograph of Travis Lulay. Lulay, who had very brief moments in the NFL with Seattle and New Orleans, caught on in the CFL with the BC Lions after a QB injury allowed him to play. He took advantage of that playing time and played himself into the starting role while also earning himself a few accolades along the way. Here is the card up-close. The autographs are also a tougher find in the product. I think he has a pretty sharp looking signature myself. I hope to see more Upper Deck NPN mail days in the future. You saw my unopened box pickups a few weeks ago at a recent auction. This topic covers all things collectible at an auction and doesn't pertain to just cards. My question is, what's the best thing you have landed at an auction? Did you get a good price for it? Was it a cool item? I wanna hear so spill the beans! 23 years ago or around then, my dad and I took a trip to a grocery store and for whatever reason bought a pack of cards on a rack that would forever change how we bonded. Growing up, my father and I bonded through collecting. We bought, we sorted, we looked up and read the Beckett before bedtime, well that was a bit of a stretch but it was close to that. It's even what got me into sports and made me who I am today. But, that ended when I grew up and moved out. We split our joint collection, I kept and still have mine, he sold off his and paid some bills. We headed in two separate directions when it came to collecting cards. I continued to increase my collection, he lost all interest in it. Up until six months ago, my father didn't have a single interest in collecting despite my constant start-up conversations, and some nagging too, when he called to say hi. Luckily one of our conversations must had finally clicked in his mind to try it again. So he took his usual weekly Walmart run with my mother and decided to pick up a few packs. And just like 23 years prior, something to do with opening up that pack brought him pure joy and instantly got him hooked all over again. 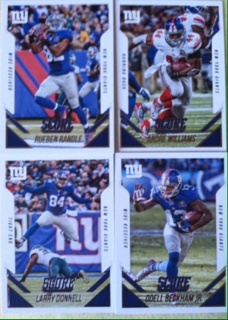 An Eight Player Tools Of The Trade /20 featuring Mike Evans and my man Odell Beckham! What a retail hit! Bet he is glad I talked him back into it! While I have your attention to, I just wanted to say, HAPPY FATHERS DAY to all types of dads out there! Hope you have a great day and if you got cards as a gift, I am sending good mojo your way! 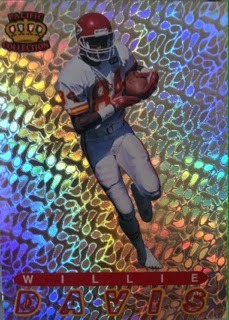 The Chrome Finish...Another Grady M Mail Day FINALE! 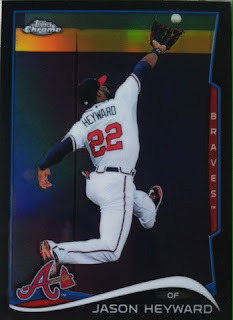 When it comes to shiny stuff, the best of the best usually comes from Prizm and Topps Chrome as the parallels become more and more interesting on a yearly basis. 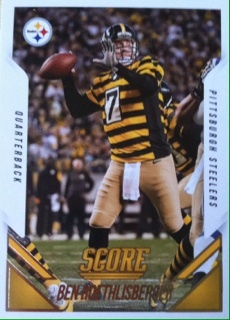 These types of cards I would take over jersey cards any day. I mean a plain colored swatch compared to rainbow shinyness is not even a comparison. GIVE ME SHINY ANY DAY! And shiny I was given. Let me catch my breath as my heart races with excitement with this finale. 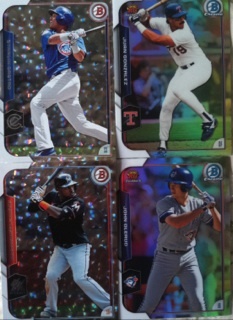 Up first are some chrome refractor parallels from Topps Heritage. The King Felix rocks. 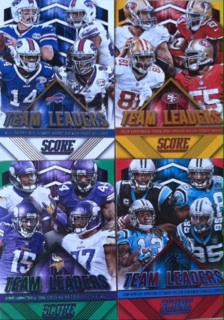 My first look at 2015 Prizm up close. The base cards are very smooth. 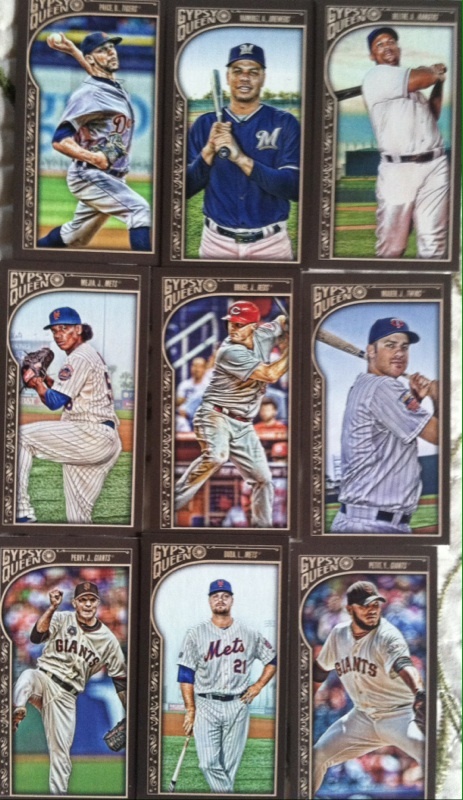 Added a Gardner to the Yanks PC and love the Sandberg from the 2014 Prizm. These look so cool. I wished my camera could had caught the color and shine better. Added some great talent here and a Mattingly for the Yanks PC. 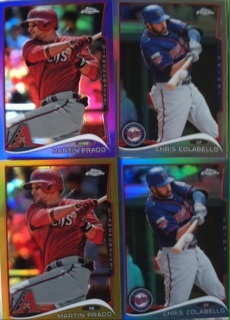 Speaking of Chrome, this mail day was loaded with refractors! The Wheeler is a blue. TONS of purple ones. Posey, Hamilton, Tulo and my man Rivera. And the finish is a Black refractor of Jason Heyward. Impressive and love the photo. 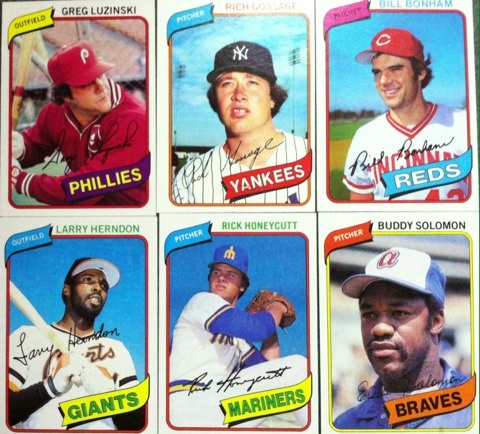 Wished Topps did more of these shots. Overall, another OVERLY impressive mail day from my bud and blog reader Grady. He is one of the most generous collector I have ever met. Grady, I am slowly putting together your next mail day and I truly appreciate your support and these incredible mail days. Thanks again! If you have Twitter and are not following Grady, please do so. He is one of the hobby good guys. You can find Grady at @RUFUSRUFFCUTT. Wait.....I am supposed to be blogging about this....sorry....got caught up in all of the shiny goodness. In every one of my Grady mail days, he always throws in a bunch of shiny stuff. It ranges from Donruss to Bowman to Prizm to Chrome. To me it doesn't matter which form it arrives, it still makes for a lot of fun. Today's shiny stuff is only Part 1 of it. Tomorrow there is even more. So I put the focus with today's on the "odds and ends" of the shiny group. 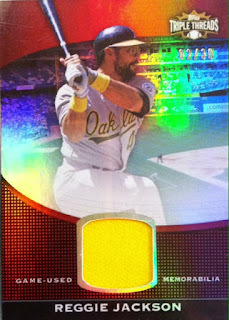 Tomorrow will be focused more on the Topps Chrome end of things. So be ready for that and in the meantime, don't get too distracted with today's shiny stuff. The one thing that can help Bowman football is making it shiny. These are much improved over the regular base. I could tolerate the product if they used these as the base cards. Some fun stuff here. HUGE fan of the Rookies and Stars Crusades. Those are a thing of a beauty. Some people just don't care about Prizm, well, if you don't, I will take them. The parallels are very impressive. This was a very nice surprise. WWE Chrome refractors. I absolutely loved finding these in the mail day. A couple of big names also including Undertaker. And to finish this up, a couple of very impressive parallels from Select football that will make your eyes cross. Overall some awesome additions to my "shiny items" PC. Like I said, this is only part 1 of the shiny stuff and part 2 will arrive tomorrow. The finale of my mail day from Grady M has even more! 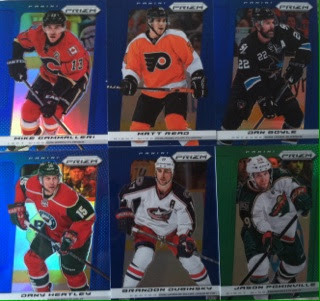 Mini's galore were found in Part 4 of my Grady mail day. I think mini's can be fun to collect especially the parallels. Up until recent, they were a pain to store. Luckily BCW has some plastic sheets I can use to store them. Originally I was sticking them into plain sheets but they bounced all around. Enough with me rambling on about storing things...we can save that for another day ;) Let's get to why you came here to see this post....THE CARDS! 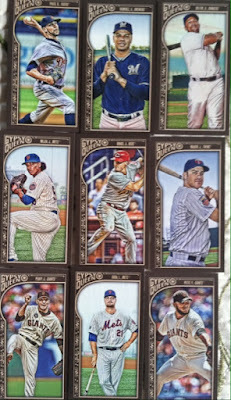 Tons of mini's here from Allen and Ginter. Nice lineup of players as well. Brock, Canseco, the Youk, Reyes and more! One of them was even numbered. I guess you can not only say the cards are mini, but this post as well. Didn't have much to say in this one, I let the pictures speak for themselves. Another mail day post down and still more to go! Check back again tomorrow! 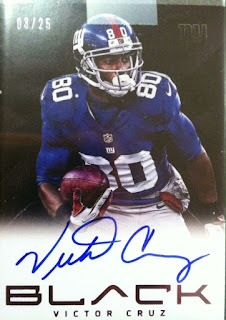 WIN This Upper Deck USA Football Auto! 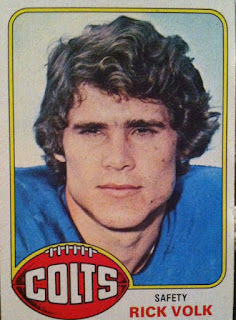 Have You Ever Seen One Of These From Topps? 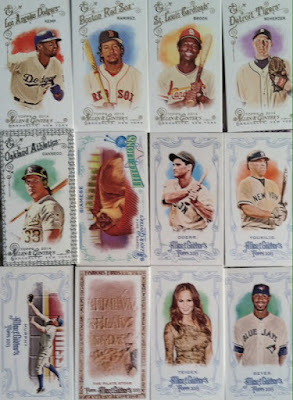 2015 Gypsy Queen WINNINGS....YOU GOTTA SEE EM!